The power of Mover Technologies allows you, the customer, to update and upload your own personal inventory for your move. This is an essential step in the process of receiving an accurate moving quote, as movers will often base the price of your move on the weight of the items being shipped, or, alternatively, based on the linear feet of your items on the truck. Upon receiving an email detailing your initial quoted estimate for a move by a moving company utilizing Mover Technologies, you should receive a link in the email to upload your own household inventory. After clicking the link, please follow the instructions listed below to complete the process. Fortunately, we have two methods available to quickly add your household goods to the mover's inventory. Click the link in your initial quote estimate email to view the quote information and inventory summary page in your internet browser. Please verify that your information is correct, and be sure to add any discount codes to the quote if you have them. Click "apply" to add the discount to the quote. You will notice an inventory summary below that should be blank, unless you or the moving company has previously entered some inventory into the move. The summary will also list any packing supplies associated with the quote if those have been previously selected. When you are done reviewing the information here, click the "Inventory Wizard" button to begin the process. Clicking the "Inventory Wizard" button on the previous step will take you to the Inventory Wizard Summary page, which shows a more detailed inventory summary. 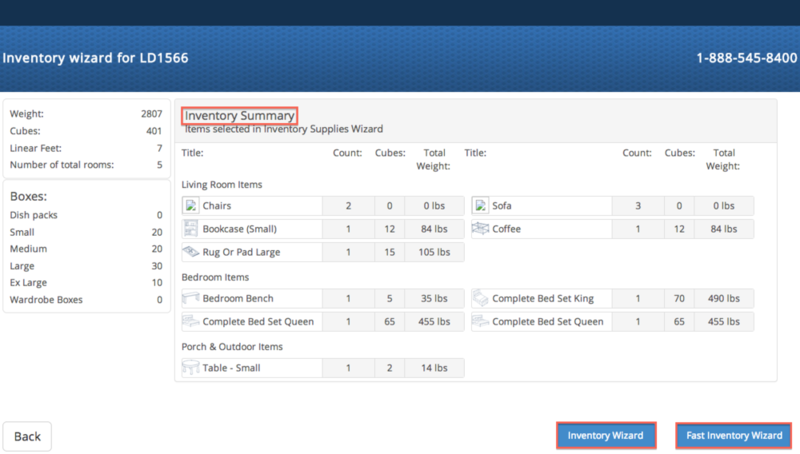 The summary shows the count, cubes, and weight of each item selected in the inventory wizard, though these fields should be blank for now. The page also presents you with two inventory wizard options. Clicking "Inventory Wizard" will take you through a more traditional household inventory wizard process, which involves going through your home room by room and selecting various items to be shipped. This is the method that we encourage you to use, particularly if this is your first time moving your household with a moving company and Mover Technologies. Alternatively, we will also instruct you below on how to use the "Fast Inventory Wizard" method, which is a more straight forward method of adding household items to your inventory. We recommend this method for individuals moving a limited number of items, or those who need a quicker way to input their moving inventory. Regardless of whether you have decided to use the Inventory Wizard or the Fast Inventory Wizard, selecting either of those options will direct you to the Online Inventory Wizard's room selector. This pop-up window will ask you to note how many rooms of each type, such as living room or kitchen, you are moving goods from. When you have entered all of the rooms in your house which you will be moving goods from, hit "Save & Next" to continue on to the next step. This step will cover the process of entering your household items into the basic inventory wizard. If you have decided to use the fast inventory wizard, please skip to Step 4b. 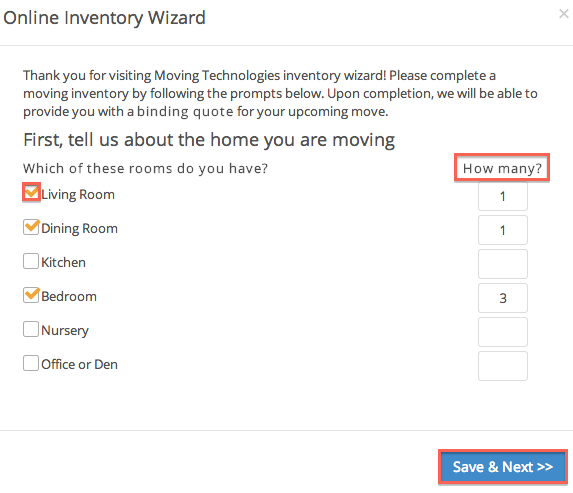 The basic inventory wizard displays a room by room inventory of household items that you can add to the quote, starting with the living room if it was selected in the previous step. Each item belonging to that particular room has a name, picture, and allows you to enter in the quantity of the item, if it exists in that room. Scroll down through all of the items, entering in the quantity of items you have that need to be moved, before clicking "Save & Next" to proceed to the next room. Please note, the basic inventory wizard will automatically prompt you to add inventory for the following rooms at the end of the process: Porch & Outdoor, Appliances, and Miscellaneous. In particular, the Miscellaneous section has options for moving items not previously listed in other rooms, as well as the ability to add customized items to the inventory wizard. Please note the dimension and quantity of the custom items to be moved before clicking "Add Item." Completing all of the rooms takes you back to the Inventory Summary page, where you can view the weight and recommended packing supplies for your inventory. This step will cover the process of entering your household items into the fast inventory wizard. If you have decided to use the basic inventory wizard, please go back to Step 4a. The fast inventory wizard is quite simple: you can search for an item by typing its name into the item name field, which displays a drop-down menu to choose your specific item from a list of similarly named items. Then, enter in the quantity of that item you are shipping and select "Add." To delete an item, click the x to the right of the item in the inventory list below. To complete the fast inventory wizard, you will need to enter all of your household items this way before clicking "Save & Next" to return to the Inventory Summary page. Congratulations! You've finished uploading your household inventory to Mover Technologies to receive a more accurate estimate from the moving company you've contacted.